January 20, 2013 Ice conditions. Well, this past weekend has been cold. The cold weather has froze everything up and the conditions for traveling across the ice are great. Getting back into Rowan and some of the portage lakes are good we have enough snow to travel across the portages. I still think snowmobiles work the best but some have brought 4-wheelers and are getting around. I suggest if you have chains for your 4-wheeler bring them with. We caught a few crappies but they were smaller this week than last weeks catch. We are excited about this upcoming weekend it is our annual Thorne Bros. ice fishing extravaganza. If you still want to get in on it we still have opening. I am heading out right now to do some prefishing/scouting before the outting. Give us a call. And I will see you on the ice. Come on up the water is hard!! It isn’t all about lake trout or even muskie, Donny caught this 44 inch pike. Donny has been coming up to Muskie Bay Resort for the past 13 years and he has this awesome ability to catch fish. So, come on up the water is hard !! 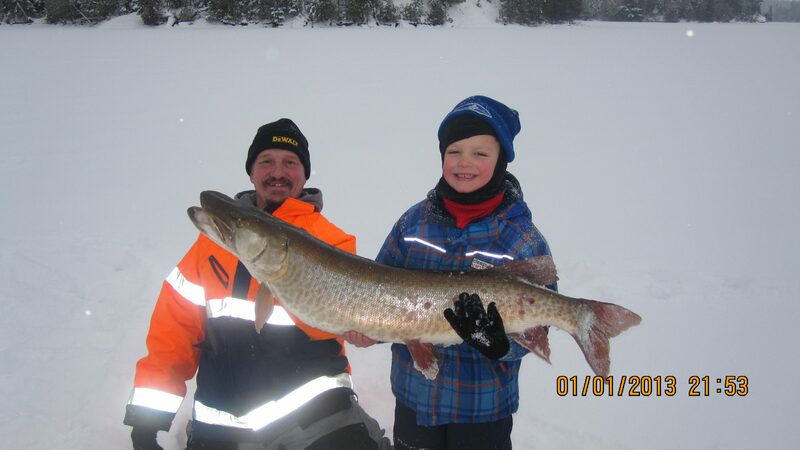 Devin’s 45 inch muskie Jan 1st, 2013. 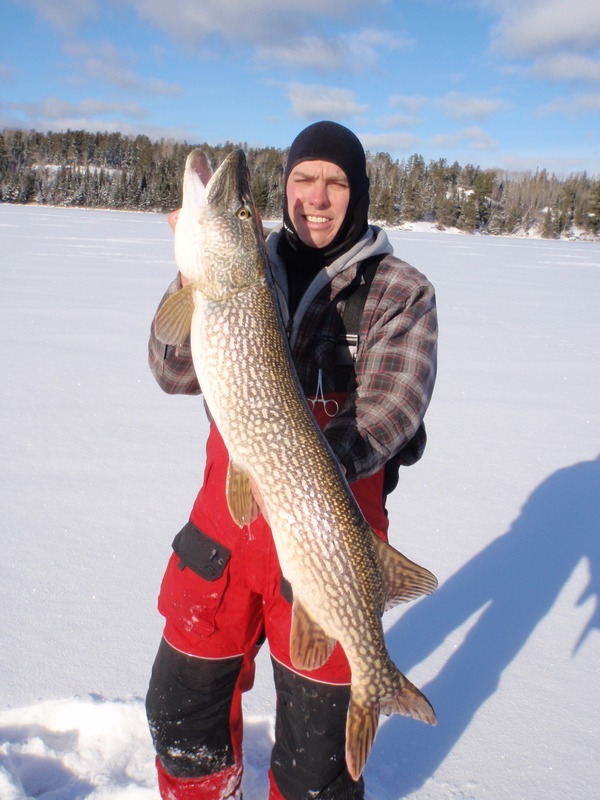 Donny’s 44 inch Pike Jan 2, 2013. We experience many seasons at Muskie Bay Resort and I enjoy them all. I prepare myself and look forward to getting ready for each. Getting out my favorite rods and reel for each species of fish. Ice fishing is on its way, we are currently watching ice being made. I am preparing my snowmobiles and ice fishing equipment getting out my Hummingbird, Vexilar and the Strike Master. I am looking forward to purchasing the new Honda powered Strike Master this year. When the ice melts and spring is on its way I look forward to the song of the Loons and frogs. I love the smell of the trees ,the fresh smell of rain, the warm summer sun, open water and the endless possibility of catching trophy fish. As each season arrives, I look forward to hunting season the most. It has its rewards, as we approach fall I prepare for the hunt. I schedule myself many hours of scouting in the secluded remote bush. This year we have added trail cameras to our arsenal. It was exciting to catch monster bucks on the camera and then with in a week we harvested that buck. Our hunting season was a lot of fun with many trophy deer. Now that the election is finally over we can look forward to the economy to get better and the uncertainty has been lifted. We can start planning for our entitled vacation with still keeping things on a budget. A trip to Canada is still an affordable vacation with seclusion, beauty, shore lunch, bonfires, star gazing, sport activity, family vacation. As we approach the holidays I reflect on what I am thankful for. I wish to express my thanks to my guests and my family for a wonderful year. I have been so blessed with the chance to be able to serve those that come to Muskie Bay Resort. This is my wife Chris and my 14th year of running Muskie Bay Resort and we look forward to many more. THIS SATURDAY: Thorne Bros. Annual Portable Modification Event will be running from 9:00-5:00!! EVERYTHING IN THE STORE WILL BE ON SALE!!!! This is your chance to see the new ice fishing product for 2012-2103, as well as save a bunch of $!!! I will be there! Come and see me this Saturday, at Thorne Bros. 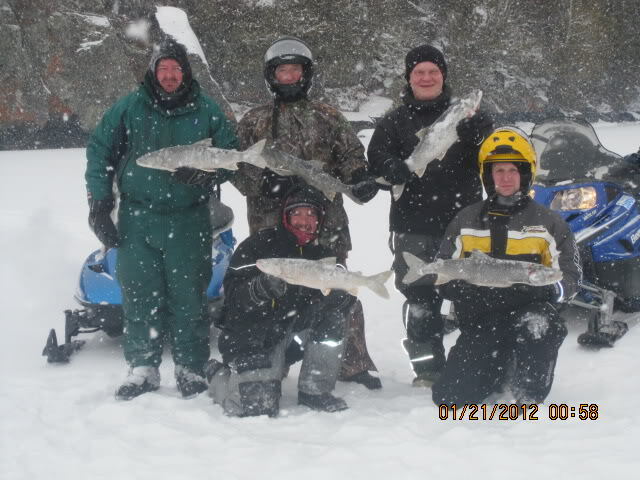 I will be giving away a free trip to the annual Thorne Bros. ice fishing outing on January 24-27 2013 at Muskie Bay Resort. Show up on Thursday and fish or get your gear ready. Supper will be provided. Friday, we will get up and have a quick breakfast of donuts and/or rolls and hit the water early. Lake Trout will be the primary target early in the day on Crow Lake and its surrounding lakes. Conditions will dictate how far we will be able to travel. We will come in for a hot lunch of sandwiches and/or soup and then head to Lake of the Woods for an afternoon of Crappie fishing. At dark, we will come in and have a hot supper. Saturday we’ll do the same, but that night we will have a dinner of Crappies and Lake Trout. Sunday morning we’ll fish and then head home. Lake Trout: Thorne Bros 42” Professional Plus, Shimano 2500 to 4000 size spinning reel, P-line FluoroIce in 8# or 10#, ice rod case, #10 barrel swivels, 3/8oz tube jigs and 3”tubes in white-ish or glow colors, Sebile Vibratos, River2Sea Glassie and Deeper Vibes and a pliers. Crappies: Thorne Bros Panfish Sweetheart Plus, Tica SS500 spinning reel, 3# P-line FluoroIce, ice rod case, Lindy #10 Fat Boys and #10 Genz/Ice Worms, Hali 25mm, Little Atom or other small plastics, #2 Jigging Rapala and a forceps. July night trolling was great, August night trolling for muskie not quite as successful. Her is a photo of my wife Chris with a 44. Lake Trout fishing has been fantastic. We have had a wonderful summer, kids going back to school and we are starting to think about deer hunting. Purchased a few nice trail camaras, going to try some different things this year. We still have openings for this years deer hunt, make it a fishing/small game/ deer hunt. Give us a call at 877-228-2076. Grouse & Duck Hunting Packages Available! Northwestern Ontario is a major migration flyway for several species of waterfowl, wood ducks, blue bills and mallards, they are abundant in this region during the fall migration. There are also abundant populations of Canadian geese and ground birds such as grouse and partridge. We have packages available today! Call or email us! Thank you Jeremy @ DWSWebsites.com for our new website! We love the ability to integrate our social media & easily update our website and push out messages & notifications to our guests & potential customers! The dashboard is so easy to use! It really makes updating our website simple. We’re excited for you to work on our search engine optimization! Hot Weather, Trout, Muskie & Bass Plentyful! We have been experiencing some hot! hot! weather. Trout fishing has been fantastic the past few days. Greg is up and is seeing a lot of muskies, we have some bass fisherman that can’t seem to keep the bass off their hooks. Life is good, when the fishing is on.